SFERRA, creator of the finest bed and bath linens in the world, turns its attention to the art of dining. Woven in Europe and sewn with an elegant hand thread-drawn hemstitched hem, we have expanded our color selection of dinner napkins, placemats, cocktail napkins and custom made tablecloths to 101 very exciting colors. 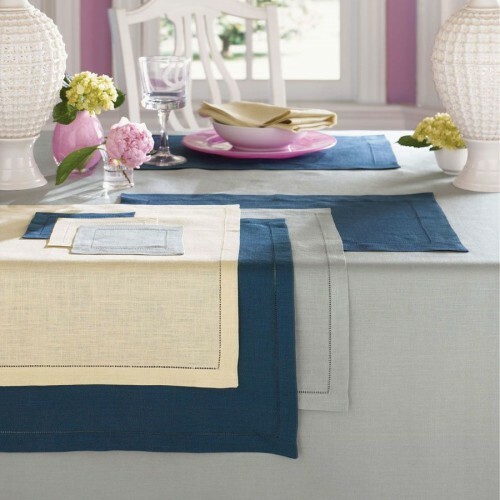 Basic linen that is beautiful: Our solid color Festival table linens come in a range of bold, luscious colors found in all of today’s best selling dinnerware. Our European woven linen is finished with a single row of hemstitching. Cocktail Napkins, Dinner Napkins, and Placemats are ready to ship upon receipt of your order, unless temporarily out of stock. Tablecloths are available by special order in the size and color of your choice. Please email us the length and width of your table and we will provide you with the pricing and lead time. Care Points: Machine wash gentle cycle with gentle detergent. Line dry or tumble dry on low, remove while still damp. Iron while damp on reverse side of fabric. Square 54 in. x 54in. Square 66 in. x 66 in. 66 x 66” Round 90 in. Oblong 66 in. x 86 in. Oblong 66 in. x 106 in. Table Runner 15 in. x 54 in. Table Runner 15 in. x 72 in. Table Runner 15 in. x 90 in. Table Runner 15 in. x 108 in.